Small Kilse Peak is situated in nearly 6 kilometers to the north-east from Foros village. It has altitude about 600 m above sea level and 220 m from its foot and is well seen from the road Yalta – Sevastopol near Sanatornoe village. It has more than 10 routes from 1-st to 6-th grade. Below there are deions of 8 routes, three more ones “Three cornices”, “8 m арта (On March 8)” and “ Копье ” have been published before. 1. Along the right part of the south-western wall, 1 Б. 2. Along the left side of the southern wall 5 А ( the route of А. Brunza and Yu .Shilov,1991). 3. Along the central part of the southern wall and the south - western ridge, 4 Б ( the route of Yu. Lishaev “ Fantik ”, 1973 ). 4. Along the central part of the southern wall via split Перо (Feather), 5 Б ( the route of S. Brunza, 1991 ). 5. By the center of the southern wall with traverse under the cornices, 5 Б (the route of V. Kozinuy, 1978). 6. By the center of the southern wall via three cornices (“Three cornices”), 6 А (the route of “Fantik”, 1986). 7.By the center of the southern wall via split Копье (“ Копье ”), 5 Б (the route of “Fantik”, 1984). 8. By the left edge of the western wall of the south-eastern ridge (“8 m арта (On March 8)”), 5 А . 9. By the buttress of the western wall on the south- eastern ridge (“ Коля - Толя (Kolya-Tolya)”), 3 Б ( the route of brothers V. and А. Volkodav, 1972 ). 10. Along the right edge of the western wall on the south- eastern ridge ( the route of А. Brunza, 1991 ), 3 Б. 11. By the lip of the south-eastern ridge, 2 А, variation 1 Б. 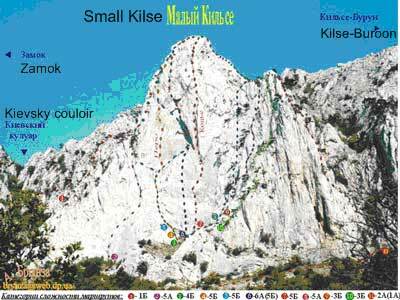 The most popular route among the beginners is the route №11, among the middle qualification alpinists it is №9, among the pros - №6 and №7. The route №7 is also called " Немецкая (German)" and Змейка (Snake). But, as for me, name Копьё (lance), connected with the fact that the route goes via Копье (lance) patch is better. Approach starts from the road widening across the western edge of the peak. Here starts a path to Kievsky couloir, dividing the peaks Zamok and Small Kilse. From the road one can ascend to the routes firstly by the path, going to Kievsky couloir, then go upwards by the slide-rocks. It takes from 15 to 30 minutes. You can descend from the peak nearly in an hour by several ways: firstly, move to the west by the marked path and descend to the old road going to Baidary above the Foros church secondly, by the abrupt Kievsky couloir and thirdly, by The Tower couloir, situated near the eastern edge of the highest peak of the region - Kilse-Buroon. It is more comfortable and safe for descent, than Kievsky.